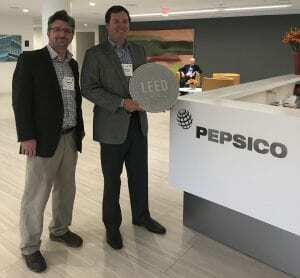 C1S Group, A Dallas-based engineering and construction firm has helped PepsiCo achieve LEED Platinum Certification at its New York global headquarters. DALLAS, Texas—October 2017— C1S Group, one of the Southwest’s leading engineering and construction firms, has helped PepsiCo, a multinational food, snack, and beverage corporation achieve the highest green building certification in the nation at its Purchase, New York headquarters. LEED Platinum Certification is awarded by the U.S. Green Building Council to companies that meet the strictest standards in the design, construction, operation, and maintenance of their facilities. PepsiCo’s LEED status is the result of nearly a decade of work and cooperation between the two companies. Certification efforts began in 2008, with C1S conducting assessments to determine what it would require. Crews started by gutting the building, before replacing the electrical and mechanical systems, flooring, carpeting, lighting, ceiling, HVAC systems, among other renovations. C1S also worked with management to install environmentally friendly pest management and snow and ice removal systems, and monitored all water usage over a one-year period. Originally, the facility had an Energy Star score of 56. A target was set to reach 80, but upon project completion, a score of 89 was achieved, meaning the facility performs better than 89 percent of buildings nationwide. It is estimated that PepsiCo will save $215,000 each year as a result of several green initiatives. Below is a list of additional project highlights. Total greenhouse gas emissions were reduced by 1,230 tons of CO2 per year, equivalent to taking 260 cars off the road for a year. A robust alternative transportation program was implemented, eliminating 34 percent of total commuting trips through vanpools, employee use of public transportation, and fuel-efficient vehicles. High efficiency indoor water fixtures were installed throughout the facility reducing consumption by 41 percent. 85 percent of construction waste was recycled during renovation.